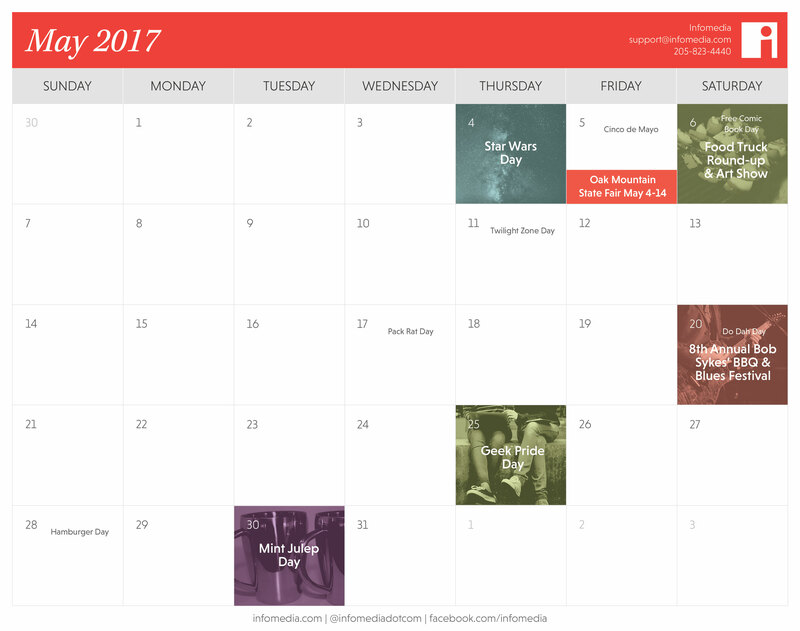 Our Free May 2017 Events Calendar is Here | Infomedia, Inc.
May is right around the corner and we’re rolling out our free calendar download of Birmingham events! We’ve got a month full of fun dates to add to your social and content calendars. If it’s a day ending in -y, we’re ready for something related to Star Wars. To be completely transparent, we have Star Wars Day circled in red Sharpie on our calendar. How will Infomedians celebrate it? Stay tuned. Do Day Day presents an opportunity to show off your fur baby. And throughout the month, Birmingham foodies will find several yummy events to look forward to: the Food Truck Roundup, Bob Sykes BBQ & Blues Festival, and Hamburger Day are all headed our way. Enjoy the May calendar, and share it with other businesses and bloggers! Feel free to follow us on Twitter for more of what’s happening around town, especially in tech.